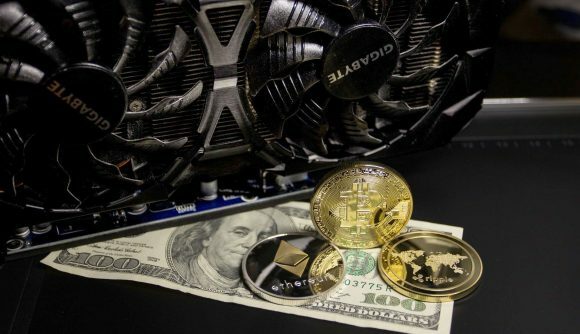 Nvidia CEO Jen-Hsun Huang has confirmed that the company “never had plans for cryptocurrency”, despite its massive impact on the company’s financials and inventory. The graphics giant, which is still operating in an over-fed market, was one of the biggest gainers, and subsequent losers, of the crypto-crash, eventually lending to a dramatic share price crash in October 2018. But Huang says it hadn’t planned for that massive surge in demand that would later leave it high and dry. In a press conference over in Tel Aviv, Huang claims that “cryptocurrency found us”. Meaning the cryptocurrency scene, set on churning over huge numbers of hashes every second to strike crypto-gold, required accelerated computing power, and its only option (barring AMD, of course) was to buy up as many Nvidia GPUs as possible. The meteoric rise in cryptocurrency left Nvidia in an advantageous position. And the company chased the cryptocurrency rabbit – as evident by the looming oversupply still ravaging its financials to this day. It was selling more GPUs than it could muster, and evidently decided to cater to that market by shipping a whole lot more out to the channel. And when Bitcoin’s value eventually plummeted, dragging other cryptos with it, the market was still being flooded by GPUs that were no longer in high demand. Nvidia’s share price also plummeted as a result. And Huang’s recent statement airs on the side of caution with cryptocurrency’s future – and its ongoing relationship with Nvidia. Back in January the company finally ate crow and wiped $500 million off its revenue guidance, claiming the oversupply, macroeconomic conditions, and “cautious” data centre demand were to blame. Huang expects the old inventory will all be gone by April, on track with its January plan. But there is something to be said in defence of the green team. When you have an audience clamouring for your product, it’s good business to keep your product well-stocked to capitalise and make some extra cash on the side. However, it’s even better business to have a plan B – or any plan whatsoever – in the off-chance that sudden spout of cash flow into the business is the flash in the pan that many analysts said it would be.